This page is for me to share about some of the work I have done, in relation to animals. To start this off I am sharing the Abstract from my dissertation, which I wrote to receive the honours for my Bachelor of Science Degree. I am in the process of uploading my full dissertation online, for anyone who wishes to read it. The Comet goldfish is an omnivorous species. Feeding this species, as well as others, on an unvaried diet is not suitable for optimum health. Commercial flake diets have variety within a meal, but this is unvaried throughout the life of the fish. 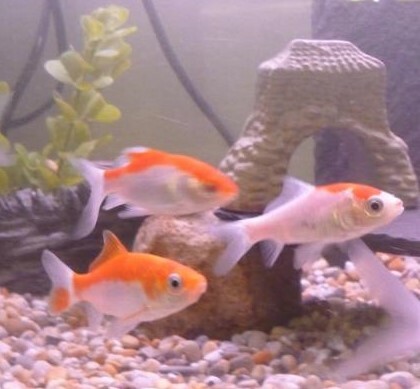 There are other food options, such as live or frozen foodstuff, which can be fed to ornamental fish. Varying the diet is suggested to enhance colouration and activity of the fish. The significance of the behaviours, throughout both studies, was seen as being P=<0.05. Many of the behaviours performed were so P=0.000 making these results very significant. In many cases not all three tanks showed significance in behaviour frequency. The colour and activity of the fish were recorded on a colour scale and an activity scale. The results of these showed an increase in both colour and activity for the two tanks which had undergone a food change, these increases happened at different paces due to the food type being fed.